Nicaraguans going to the polls today will find a familiar name on the ballot: Daniel Ortega, ruler of Nicaragua from 1979 to 1990 and again from 2007 onwards is seeking re-election. Moreover, armed with a decision not invite foreign observers to monitor the proceedings, the leader of the Sandinista National Liberation Front (FSLN) and hero of the Nicaraguan Revolution only seems prepared to present voters with a political “Hobson’s choice”. In June, Nicaragua’s Constitutional Court banned Eduardo Montealegre, leader of the Independent Liberal Party (PLI) and Mr Ortega’s foremost rival in the previous two elections, from putting forward his presidential candidacy. The court similarly barred his successor, Luis Callejas, taking it upon themselves to nominate Pedro Reyes – a man regarded by many in the opposition as an Ortega stooge – as PLI leader. When 28 opposition legislators objected, the court flexed its constitutional muscles once again, removing them from the National Assembly and authorising Reyes to find replacements. To top it off, in September, Mr Reyes himself resigned his presidential candidacy, leaving the Mr Ortega’s opponents leaderless in the run-up to November’s election. While the shenanigans of the summer have left the primary opposition in carefully-orchestrated chaos, other candidates will be on the ballot paper. However, for the most part, they are a salad of electoral first-timers, social conservatives and left-wing factionalists, none of whom have the political capital and infrastructure to mount a serious challenge to another five years of Ortega rule. Mr Ortega’s actions – delivered by proxy through the constitutional court – bear all the hallmarks of political consolidation. Since January 2014, when the National Assembly voted to allow him to seek indefinite re-election, and now with another presidential term all-but guaranteed through to 2021, the question has become not so much how the Ortega grip on power is dislodged as how it is passed down. 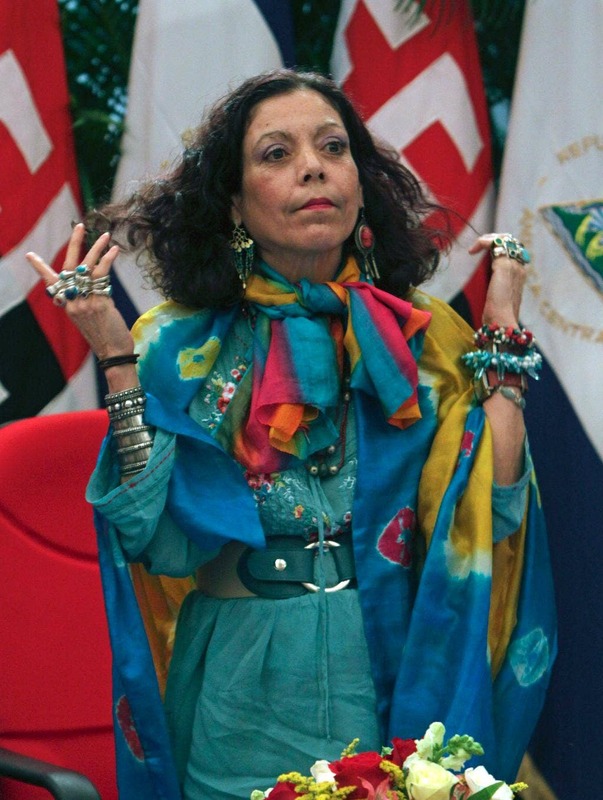 Step forward Rosario Murillo, the flamboyant First Lady of Nicaragua. A distinguished poet and revolutionary in her own right, Ms Murillo has grown in stature during her husband’s latest term of office, as a spokesperson and public face for FSLN government. In this latest round of elections, she is seeking to formalise her position, running for vice-president alongside her moustachioed spouse to establish a firm family grip on domestic rule. The marital duo will certainly make a novel addition to the Nicaraguan political scene – normally Article 147 of the Nicaraguan Constitution prevents the president’s immediate relations from holding high office, but earlier this year, the ever-reliable constitutional court found that this rule applies only to consanguinity and not relationship by marriage. How fortuitous! In the second decade of the 21st Century, the Ortega clan is beginning to bear an eerie resemblance to the Somoza dynasty, the family regime that ruthlessly ruled over Nicaragua for much of the 20th Century and against whom Daniel Ortega and his fellow Sandinistas fought so hard in the 60s and 70s. This is not to say that all is rosy in the garden: ambitious, wealth-creating infrastructure plans have flopped, with a Chinese-backed project to build a canal to rival Panama’s famous waterway running aground. And while the government has not published any employment statistics since 2011, estimates suggest that the rate of low-paid, informal work remains stubbornly high, encompassing roughly 60% of the Nicaraguan population. However, serious though these problems may be for any developing nation, they pale in comparison to the violence and degradation the country experienced in the final decades of the 20th Century, now memorialized in Managua’s Parque de la Paz. From a purely practical point of view, what Nicaragua lacks in its rigged electoral processes and nobbled judiciary, it makes up for in the rare peace and stability that de facto one-party rule facilitates. Whether the security brought by the nascent Ortega dynasty can be maintained across the political generations remains to be seen. In Nicaragua, the lesson from the Somozas is that it is easier said than done. This entry was posted in Elections, Nicaragua, Politics. Bookmark the permalink.